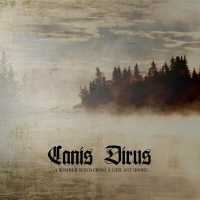 Forged in the desolate hinterlands of Minnesota in the United States, Canis Dirus make their debut with A Sombre Wind From A Distant Shore. This outfit plays a melancholy and atmospheric blend of funeral doom metal and ambient black metal. The resultant elixir is both mesmerising and potent, with fuzzy guitar rhythms complemented by more traditional solos and a subtle battery that at times rises from the ashes to punish the unwary. Multi-instrumentalist TMP uses acoustic guitars and sweeping vistas of electrical cacophony to weave a spell that sends the listener back to a time when the dire wolf of indigenous North America roamed the vast plains. It was a primeval time, one in which the wolf journeyed far and wide. Throat RH gives said wolf a voice, a high-end screech that bays at the moon in response to the theft of its freedom. The duo’s debut album is given a classical structure that consists of an intro (Choking And Drowning) and outro (…In Deep Waters), between which reside four compositions, each of which exceeds eight minutes in length. Pace is slow, with the drive of the music intentionally fuzzy. Only the guitar solos and the vocals escape from the miasma. Songs such as Joyless And The Self Fulfilling Prophecy, and In The Season Of The Shadows, also contain minimalist interludes designed to leave the listener within his own thoughts – the resultant haunting leads to a sense of self-loathing to those willing to let the music flow through them. Listeners who enjoy the murky sounds of Burzum and Xasthur and the sounds emitted by drone and funeral doom metal will be like moths drawn to the flame with A Sombre Wind From A Distant Shore. Like the best bands of these genres, the music will leave your body feeling cold.